Master BR with private bath, Eat-in Kitchen, Laundry Hook-ups, Living Room, Formal Dining Room, Family Room w/fireplace, Screened Porch, Cathedral Ceilings, irrigation System, etc. Pride of ownership shows in this bright & spacious colonial located on a beautiful lot with fenced in back yard great for kids to play and dogs to run. Crown moldings in formal dining room. Large eat-in kitchen w/ recessed lights and granite counter tops. Laundry room conveniently located off the kitchen. Huge family rm w/large window, cathedral clng & gas fireplace. There is a nice screened porch off the family room overlooking private back yard. Formal living room with french doors. For those working at home there is an office with a walk up to a huge unfinished attic. Master bedroom w/ walk in closet & private bath, his & hers sinks. Roof is only 3 years old. Freshly painted interior. Finished room in the basement great for a playroom or perhaps a "man cave". Conveniently located to RT 93, 5 minutes drive to the golf course & Less than 1 Hour to Boston. 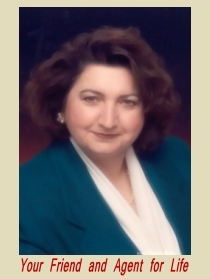 Alina Tobin's Southern New Hampshire Homes, Serving the Counties of: Rockingham, Hillsborough, Strafford, and Merrimack; Specializing in the towns of: Londonderry, Derry, Hudson, Litchfield, Windham, Pelham, Raymond, Salem, Sandown, Chester, Durham, Lee, and Dover. 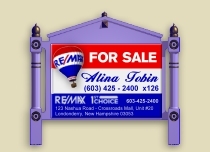 Featured Property - Sizzeling Hot, Call Alina Tobin at: 603-425-2400 x126; Email Alina Tobin at: AlinaTobin@SNH-Homes.COM; RE/MAX 1st CHOICE, Crossroads Mall, Unit 20, Londonderry, New Hampshire, NH 03053; FAX: 603-434-2599; Visit my website for Seniors at: WWW.SeniorsRETeam.COM; For Sale; Copyright © 2000 - 2006 Alina Tobin, All Rights Reserved. RE/MAX ® and the 8ot air balloon are registered marks owned by RE/MAX International, Inc. The RE/MAX 1ST Choice Office is independently owned and operated. If you have comments about this page, send them to the Webmaster - at Southern New Homes for Sale.